Junior Symone Abbott received Big Ten honorable mention honors in what was a tough season for the Wildcats in 2016. Thanks to the thing of evil that we call the quarter system, Northwestern fall sports teams have played almost half their regular season games by the time students actually arrive to campus. Now that just about everyone is back in Evanston and Wildcat Welcome is coming to a close, here’s what you missed in women’s volleyball. Northwestern women’s volleyball (10-2, 0-0 B1G) is off to an impressive start in 2017, posting a .833 winning percentage in non-conference play and already matching their win total from last year. The team came into the season optimistic that they would improve upon a 10-22 record in 2016; however, there were many questions marks, as seven of the 20 women on the roster are first-years. Under the leadership of second-year coach Shane Davis, the Wildcats started the season in Tampa, Florida, defeating the University of South Florida and losing to LSU before ripping off a nine-game winning streak, including two 3-0 performances at the Duke and DePaul Invitationals. The ‘Cats finished non-conference play with a 3-0 loss to Virginia Commonwealth University. The undisputed leaders of the squad are the three seniors: Taylor Tashima, Symone Abbott, and Gabrielle Hazen. 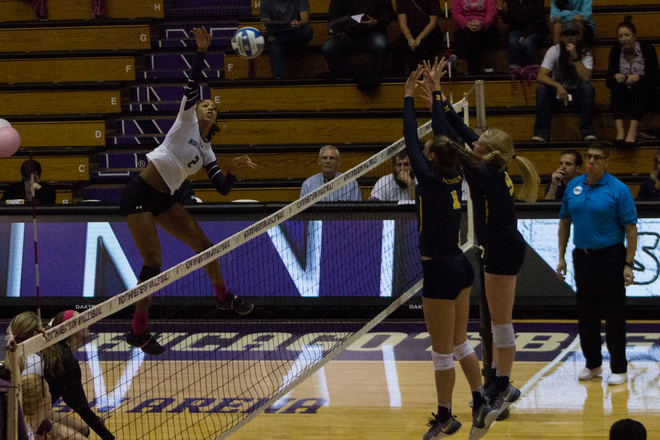 Tashima, a setter, has recorded 175 blocks in her Northwestern career (including 27 already this year) and currently ranks 5th in assists in NU history (with 3,463). Abbott, an outside hitter, is 3rd all-time in kills per set with 3.71, and Hazen, a middle blocker, is top 10 all-time in hitting percentage with a mark of .306. On the season, Northwestern has won 32 sets and lost only 9. In addition, the Wildcats have recorded 591 kills versus opponents’ 414, a .284 attack percentage versus a .150 clip for opponents, and 74 aces vs. 33 aces allowed. Notable wins include a 3-0 sweep against previously undefeated Duke as well as sweeps against South Carolina, North Carolina-Wilmington, Milwaukee, DePaul, and Bowling Green. Individually, Abbott leads the team with 177 kills and 485 attack attempts, Tashima and sophomore Sarah Johnson lead with 16 service aces apiece, freshman Lexi Pitsas leads in digs with 128, and Hazen leads with 52 total blocks. Despite a successful non-conference slate, the ‘Cats face a tougher test when Big Ten play begins on 9/20 against Purdue. Conference foes Minnesota, Penn State, Wisconsin, Nebraska, Michigan, Michigan State, and Ohio State are all in the AVCA Coaches’ top 25 rankings. However, with a freshman class that ranked 22nd nationwide according to PrepVolleyball.com, things are looking up for the Wildcats.